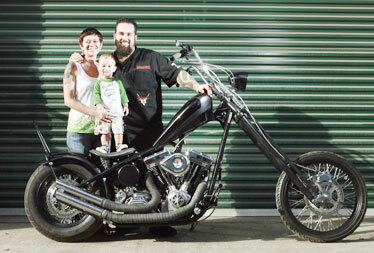 Moana and Chase Deacon pose with their son Axl, 17 months, at Pro-Street Custom Cycles in Kailua. Axl is suffering from craniosynostosis, a disease that deforms the skull, and is scheduled to have surgery next month in Texas. Axl Deacon is just like any other 17-month-old child, except for one thing: He suffers from a rare disease that causes normally soft and un-fused bones of the skull to close and harden, giving the brain too little space to develop. Time: Noon to 6 p.m. Sunday. Gates open 11 a.m.
Tickets: $20 at the door. Children 12 and under free. Raffle: $5 tickets to win a custom-made Harley-Davidson worth more than $18,000. Tickets bought for $20 in advance include the raffle ticket. The skull then deforms in response to the pressure of the child's growing brain. "I was in denial for a long time," said Axl's mother, Moana Deacon. "I kept saying he's fine. Then we started noticing his head looking different, like a football rather than a head." After a six-month wait for an appointment with a specialist in Hawaii, Axl was diagnosed with craniosynostosis, which occurs about once in every 2,000 births. The condition can be corrected with surgery, which entails de-fusing the skull's seams and removing bone, instantly reforming and correcting the skull shape. The problem? There is no specialist in craniosynostosis in Hawaii, according to Deacon. Searching on the Internet, she found Dr. Jeffery Fearon, who operates the Craniofacial Center in Dallas. Fearon is a specialist who has performed more than 8,000 craniosynostosis surgeries and has developed techniques to make the procedure more successful and comfortable for the child. But the Deacons' health insurance will not cover the cost of an out-of-state surgery. The cost of the operation, travel, accommodations and unpaid time off work will be about $50,000, Deacon estimates, far more than the family has to spare. Husband Chase Deacon will take unpaid time off work for the two-week trip to Texas for the surgery. To raise money for the procedure, scheduled for June 15, the family is holding a fundraising motor sports event Sunday at Kapaa Quarry. The family has been spending their free time putting up fliers and organizing the event. "It's been insane," said Axl's father, Chase Deacon. "I've been out all night putting up fliers, trying to get donations." He has also been overwhelmed at the amount of support and help from friends and strangers. "I believe in taking care of people, and I'm a firm believer in karma, so what goes around comes around." Axl's grandfather Mark Deacon is a widely known Harley builder on Oahu, so the motor sports community has become involved with the fundraiser. Craniosynostosis, not considered genetic, can be caused by the position of the child in the womb, specialists say. Pressure on the child's skull can cause the skull bone edges, or sutures, to harden prematurely, instead of remaining soft and loose. The hard, or fused, skull sutures are then unable to expand naturally with the rapidly growing brain, causing deformation. "We started looking into it, weighing our options," said Moana Deacon. "The unknown was the scariest part." "They have to cut his head open ear to ear and remove the bones and put them back in the right shape," she said. But the potential complications and a face-to-face meeting with Fearon persuaded them to proceed. "If we don't do the surgery, he could develop migraines, possible seizures, possible blindness, learning disabilities," Deacon said. "We want to save him from having to be teased or feel weird when he starts going to school," she added. Accounts in the name of Axl James Deacon to accept donations have been opened at Bank of Hawaii and First Hawaiian Bank.